God’s 6000 Year Plan: Dating Jesus’ Latest Return? Has God given man 6000 years to rule himself before Jesus returns to take over? Many Christians think the Bible teaches this and they leverage it to predict the year of Jesus’ Second Coming. But is it possible? How do you count the years? What do they start from? (Hint: not Adam/Creation) Also, what does Adam’s age for Seth’s birth tell us about the latest that Jesus can return? One of the great secrets to Bible prophecy is the understanding of the prophetic nature of the feasts of the LORD ("Yehovah "), understood commonly as the Jewish holy days. It appears that this key has been mostly unknown until around the turn of the century. But nowadays you can find many, mostly Messianic teachers teaching it. (Most of whom I'd wager learned about it from Michael Rood, as did I in 2000). If you are not already familiar with the concept, the idea is that the appointed times which God gave to Israel to keep were also prophecy. They contained a prophetic "shadow of things to come" (Col 2:17). Or as Jesus said, he came to fulfill the Law because "not one jot or tittle would pass from the Law until all are fulfilled" (Mt 5:17-18). Jesus did not fulfill all of it, just the spring feasts (Passover, Feast of Unleavened Bread, Pentecost) and many other aspects. The fall feasts (Day of Trumpets, Day of Atonement, etc.) and other aspects are yet to be fulfilled. It's these other aspects that we'll focus on in this article. While many teachers grasp how the annual spring and fall feast days of Leviticus 23 are prophetic, few apply what Jesus and Paul taught about the Law (or Torah) to the Sabbath day which is also found in Leviticus 23. The Torah has several instructions relating to groups of six days or years followed by a seventh that is distinct. These verses illustrate a pattern of six days or years being for work or enslavement and then in the seventh day or year to rest or be set free. The picture of the Sabbath day goes beyond just rest from work to being a day to cease from self-interest and to honor God. So what are the Sabbath day and the six preceding days a prophecy of? Psalms 90:4 — For a thousand years in thy sight are but as yesterday when it is past, and as a watch in the night. 2 Peter 3:8 — But, beloved, be not ignorant of this one thing, that one day is with YHVH as a thousand years, and a thousand years as one day. These passages establish what is called the "day-for-a-year" principle. It means that when the Bible uses or refers to days, sometimes what is meant, at least on a prophetic level, is years. This is seen most prominently in Daniel's "70 Weeks" prophecy (Dan 9:24-27). The common accepted understanding interprets the 70 weeks as not literally 490 days, but 490 years. The first 69 weeks of years predicted the timing of Jesus' first coming and the final or 70th week describes the seven years leading up to Jesus' Second Coming. The implication of this is that besides the Sabbath day and Sabbath year, there is also a Sabbath millennium. What is the Sabbath Millennium? This "Sabbath millennium" concept may sound familiar. Most people are already familiar with Revelation's prophecy of the 1,000 year reign of Christ and his saints . It's taught in Revelation 20 where the phrase "1,000 years" is repeated six times. Rev 20:6 — Blessed and holy is he that hath part in the first resurrection: on such the second death hath no power, but they shall be priests of God and of the Messiah, and shall reign with him a thousand years. Isaiah 2:4 — He will settle disputes among the nations and provide arbitration for many peoples. They will turn their swords into plows and their spears into pruning knives. Nations will not take up the sword against other nations, and they will never again train for war. Isaiah 11:9 — They shall not hurt nor destroy in all my holy mountain: for the earth shall be full of the knowledge of YHVH, as the waters cover the sea. Revelation 20:2 — He seized the dragon, that ancient serpent who is the Devil and Satan, and bound him for 1,000 years. You can see just from this sampling of verses how different the Sabbath millennium is from today's world. It's in stark contrast to all the preceding millennia filled with deception, confusion, war, destruction and hurt. It fulfills the picture of the Sabbath day that we saw above. If the Sabbath millennium mirrors the Sabbath day, it follows that the preceding six work days likewise mirror six millennia of human history leading up to Jesus' return. It would be a time that God has allocated for man to "work" things out on his own, including governing himself. Meanwhile God mostly works only behind the scenes to keep things on the 6000 year schedule. Once you know about the 6000 years of man, the immediate desire is to know when Creation was so that you can add 6000 years to it. Here's the best answer to that question that I have found. 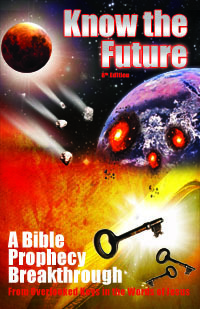 There is a researcher by the name of Eugene W. Faulstich who spent a lifetime researching biblical chronology with the aid of astronomical computer programs. Among the many dates he was able to verify from Scripture was the date of Creation. He determined that Creation Week was March 19th-25th, 4001 BC and that the 8th day was a new moon marking the first month of the first year (Aviv 1, 1) at March 26th, 4001 BC. What he found was there was a "singular planetary alignment"  on the 5th day of creation which has never happened since. Likewise, there was a planetary alignment on the summer solstice of that same year which is also incomparable in history. Why is that important? Genesis 1:14 tells us that one of the purposes of the heavenly bodies is to mark times and give signals. We would therefore expect something significant to be evident in the heavens for a time as important as creation. Likewise, we might expect there to be a similar astronomical event to demarcate the end of the 6000 years. And there has. On May 5th, 2000 C.E, 6000 years from 4001 BC, there was another rare planetary alignment. It was a conjunction consisting of Venus, Mercury, Sun, Jupiter, Saturn, Mars, and the Moon. This also happened to be the night of the first visible sliver of the new moon. Biblical years start with the first new moon in the spring after the barley is aviv, or mature . The barley had not been aviv for the previous new moon on April 6th which the calculated calendar that the Rabbis use prescribed as Aviv, 5760. This was also the first new moon in Jerusalem in which the barley grain was ready to be harvested, or aviv. Aviv is the name of first month of the year and is so named because it can only be declared when the barley is aviv so that as early as 15 days later it can be harvested and used in the Feast of the firstfruits rehearsal (Ex 9:31, 13:4, 12, Lev 23:4-11) of the first month. This seems to confirm that May 5th, 2000 was actually Aviv 1, 6001, the start of the seventh millennium from Adam or Creation. However, if that's the case, then we are way past 6000 years from Creation. This disappointing realization is not new. If you have been aware of this "6000 year plan of God" doctrine for some time like me, you know that even before the year 2000, it was common to see people trying to use this theory for date-setting . They believed that if they could determine the actual year of Creation, they only had to add 6000 years to that and they believed they would know when Jesus was coming back. But after we passed the year 2000, most chronologies, like Bishop Ussher's and the one above put us already in the Millennium or at least in final seven years of Daniel's 70th week. This creates a big problem for the 6000 years of man theory. How could it be true if we already passed 6000 years from Creation? How Do You Count A Year? The answer to this doubt is that while it is true that the Bible and over a dozen calendars indicate that Earth used to have a 360 day year , it's important to note that changing length of the year does not change the definition of a year. Because we are used to saying "a year is 365¼ days" we can fall into thinking that years can be reckoned by days, or the 24 hour revolutions of the earth. However, the real definition of a year is not X number of days, but rather one complete orbit of Earth around the Sun. Calendars intercalate leap months or leap days in an attempt to keep the days and months of the year in sync with this astronomical reality of the seasons coming from earth's orbit. Others ask why we have to make it so hard when we have the Jewish Calendar showing a year less than 6000 such as the year 5773 for 2012. What most do not realize that the rabbis and scholars do is that there is an error in that reckoning, by some 240½ years (the half year because they improperly start the year in the Fall, rather than the Spring as the Bible instructs ). Some say this is on purpose to hide the coming of the Messiah as Daniel's 70 weeks predicted  right down to the year he came. Whatever the reason, there is admitted tampering and lost years to make the Jewish Calendar say we have passed a significantly smaller number of years since Adam than Bible chronologies say we do. Obviously by the right definition of a year and not tampering with it, there's no doubt that we have passed 6000 years from Creation. If that is the case, then does that mean the 6000 years theory is disproven? The solution to the quandary lies in questioning the assumption that the 6000 years began at Creation. This assumption does not consider that while Adam and Eve were still in the Garden of Eden, they were obeying God and under his government, the Kingdom of God . The 6000 year clock of man's self-rulership should not include that idyllic period. Man's striving against each other and God only started once Adam was kicked out of the Garden of Eden for rebelling against God's rulership. (Of course due to eating the fruit of the tree of the knowledge of good and evil.) Only then did Adam begin building his own independent life that the six work days/6000 years picture. OK, great. Then what year was "the Fall of Man?" As you might expect, the Bible does not make it easy to answer that. For example, it never tells us how long they were in the Garden. If it did, we would be able to predict the return of Jesus by it long, long ago, certainly by the time of Jesus when he said no man knows (yet) . Therefore, I think it was purposely concealed, unlike the year of Creation which I believe is knowable using Biblical chronology or other reckonings. Application: The Last Possible Year for Jesus' Return? The 6000 years of man's self-rule appears to be a Scripturally sound teaching and useful insight into the plan of God for preparing man to receive his Kingdom (again). However, it may seem like it is a dead end for getting an idea of when Jesus can come back. Nevertheless, there is one interesting point that does come out of this research. Although we cannot calculate far in advance the year of Jesus' Second Coming , we can place an upper limit to that year. Genesis 5:3 — Adam was 130 years old when he fathered a son in his likeness, according to his image, and named him Seth. How does this help? If you never noticed, Adam and Eve did not begin having children (Gen 4:1) until after they were banished from Eden (Gen 3:23). This means that the longest they could have been in the Garden would have been somewhere under 130 years. The reason is that they did not have Seth until Cain slew Abel; Seth replaced Abel. How old would Cain and Abel have been to be producing food which they also sacrificed to God and for Cain to be mature enough to murder Abel? 13? 20? 30? It's impossible to know, but it's hard to imagine in such simple times a ten year old or teen killing his brother. In the Bible the age of accountability is 20 years  (Ex 30:14). If we go with 20 years as a conservative lower limit for the age of Cain when he slew Abel, then that means Adam was no older than 110 (130 - 20) when he became a father to Cain and Abel (who possibly are twins). If you conservatively assume Adam had Cain on the first year that he left the Garden, then that makes 110 years the maximum time he was in the Garden (give or take nine months gestation for Cain and Abel and another nine for Seth before he was born at Adam's age 130). If 2000 was the year 6001 from Creation, then you add the 110 to that giving us 2110 as around the latest possible year for Jesus' Second Coming. That's still a long ways off. It's not exactly very comforting to those anxiously awaiting Christ's return. However, keep in mind that this is only speculation on the longest it could be. It's not setting a date for when it will be. I personally believe more and more that there are reasons to conclude it will be much sooner than that, like 2030 which if correct would mean the "the end" or "birth pains"  Jesus spoke about beginning in 2026 .